Analogue filters will always be needed for interfacing between digital systems and the 'real' analogue world. In fact, the high frequency integrated analogue filter has become a key component in achieving ubiquitous communication and computing. In recent years, the renewed interest in analogue, mixed-signal and RF circuits due to the need for system-on-chip design and the market for wireless communications has led to a new peak of research into high frequency integrated analogue filters. 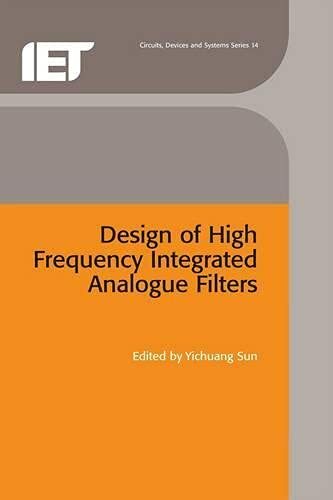 This book brings together the leading researchers in high frequency analogue filters to highlight recent advances and identify promising directions for future development. Coverage includes Gm-C filters, MOSFET-C filters, active-LC filters, logdomain filters, switched-current filters, adaptive analogue filters and on-chip automatic filter tuning. The topical nature of the book and calibre of the authors ensures that this book will be of great interest to the electronics and communications communities worldwide. Yichuang Sun is Professor of Communication Electronics and leads the Communication Networks Group at the University of Hertfordshire in the UK. He obtained B.Sc. and M.Sc. degrees from Dalian Maritime University in China and was awarded a Ph.D. from the University of York in the UK. His research interests include analogue and mixedsignal circuits, testing and fault diagnosis, RF and communication circuits, and wireless communication systems. He has published over 120 papers and has coauthored a book entitled Continuous-time Active Filter Design, published by CRC Press, USA. Professor Sun has also been a Guest Editor for two special issues of the IEE Proceedings on Circuits, Devices and Systems. He is a Senior Member of the IEEE and serves as Vice-Chair on four Technical Committees including the IEEE Circuits and Systems Society, the IEEE Communications Society and the IEEE UKRI Section. He is Guest Professor at Hunan University of China.